Parfait pour les marins et les amis proches, cet espace style loft dit simplement «cool»! Lit mi-siècle superposé et lit gigogne, plus un futon si vous ne aimez pas les célibataires. À quelques pas de Thames Street et le quai de Bowen, ce est aussi proche qu'il obtient des meilleurs restaurants, boutiques et bars de Newport. Si vous aimez les espaces architecturaux uniques sur la salle immémorial standard, ce est pour vous. Plus la hanche et le plaisir plutôt que de luxe, vous finir aimer cet espace. Mais être à zéro pour tous les Newport a à offrir, vous aurez du mal à rester à l'intérieur. Le bâtiment abrite actuellement un petit bureau à l'étage et un magasin d'antiquités adjacente. Il ya un parking pas sur place, mais un parking public est juste un pâté de maisons. Douche murale de base, le style Home Depot. This is a perfect place for a girls trip or friend getaway of 4. A place with character. Heads up there is no stove here so plan to be eating out if you are coming to town or shop for easy things to make via microwave or non cooking. It is an old firehouse so noise is not always perfect if someone is walking around above the sleeping area but really not a big deal. Plenty of towels and the fridge is big. The best part of all is the location of this property. If you’ve ever been to Newport you know this can be ideal for walking to shops and places to eat. Starbucks is literally on the corner..yay! It was so close to the main section of town right between it all. We loved it! I stayed here with 2 friends for a girls weekend in Newport. We were so so happy with this place, especially it’s proximity to basically everything- steps from all the restaurants we ate at, the pier with boat cruises, and shopping on Thames St. The space was comfy and the property manager was responsive to all our questions. Would stay here again! We parked in Mary Street Lot a block away- I would recommend this lot as it seems to be the only available overnight parking in the immediate area. Thanks for a great weekend! The loft was large, comfortable and everything worked - highly utilitarian. 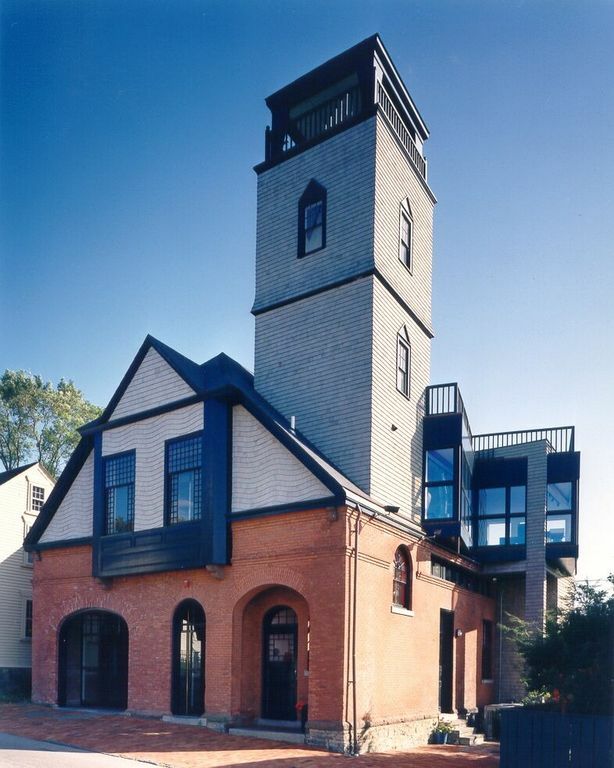 It is also a unique structure, so interesting - an old firehouse. Right in town so everything is there and no need for cars or parking. The staff was pleasant and responsive, they did everything right. Great value for an all around productive experience that worked. Perfectly located well appointed apartment! My mother and I were here for a destination wedding, and, unbeknownst to us, it turned out that the venue was basically across the street! In fact, we were one half block away from everything! Needless to say, we never needed our car and walked everywhere. The apartment itself was beautiful, with just the right amount of amenities. There is no stove, but like I said, one is pretty much a block or so from a myriad of restaurants, so none needed. There is a microwave, full fridge, ice maker in the freezer, standard coffee pot, and Keurig. We were sufficiently stocked with snacks, sodas, water, coffee pods, sugar,etc. We would have had to stay for 2 weeks to go through the supply of bath towels!!!! I would highly recommend this apartment for a girl's getaway as the sleeping quarters consists of all twins. I did notice a couch/futon for couples. The living area was massive and could easily accommodate a dozen people if you had others staying nearby and wanted to meet up to socialize. Thank you to Jed and the manager Michele for making our stay comfortable and memorable! The location was great, in walking distance to everything downtown. The manager Michele was awesome we were able to get in touch with him regarding anything we needed. The place was clean ...location is key would definitely go back again!